An axial compressor is typically made up of many alternating rows of rotating and stationary blades called rotors and stators, respectively, as shown in Figures 12.3 and 12.4. The first stationary row (which comes in front of the rotor) is typically called the inlet guide vanes or IGV. 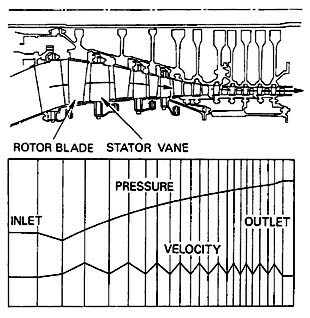 Each successive rotor-stator pair is called a compressor stage. Hence compressors with many blade rows are termed multistage compressors. 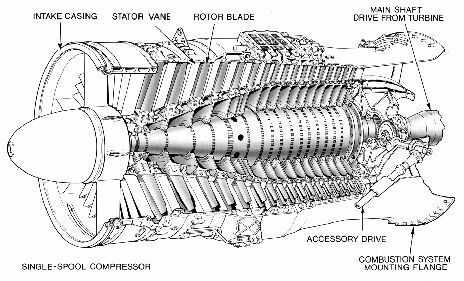 Figure 12.3: A typical multistage axial flow compressor (Rolls-Royce, 1992). Figure 12.4: Schematic representation of an axial flow compressor. One way to understand the workings of a compressor is to consider energy exchanges. We can get an approximate picture of this using the Bernoulli Equation, where is the stagnation pressure, a measure of the total energy carried in the flow, is the static pressure, a measure of the internal energy, and the velocity terms are a measure of the kinetic energy associated with each component of velocity ( is radial, is tangential, is axial). The rotor adds swirl to the flow, thus increasing the total energy carried in the flow by increasing the angular momentum (adding to the kinetic energy associated with the tangential or swirl velocity, ). The stator removes swirl from the flow, but it is not a moving blade row and thus cannot add any net energy to the flow. Rather, the stator rather converts the kinetic energy associated with swirl to internal energy (raising the static pressure of the flow). Thus typical velocity and pressure profiles through a multistage axial compressor look like those shown in Figure 12.5. Figure 12.5: Pressure and velocity profiles through a multi-stage axial compressor (Rolls-Royce, 1992). Note that the IGV also adds no energy to the flow. It is designed to add swirl in the direction of rotor motion to lower the Mach number of the flow relative to the rotor blades, and thus improve the aerodynamic performance of the rotor.